Built around 1250 as a residence for the archbishops of Trier, Zell is really more of a palace than a castle. For seven centuries the building has survived with little damage to its charming structure of two round frontal towers connected by an outside wooden balcony. An old wooden wine press in the front garden was used to make the original Zeller Schwarze Katz wine. In 1512 the Emperor Maximilian was a guest at the castle, as well as the Prussian king Friedrich Wilhelm IV in 1847. A Napoleonic order later led to the secularization of the property. Travelers who like to explore small villages while tasting the local wine will find that the Mosel River valley offers everything the Rhine does, but on a smaller and gentler scale. The villages are just as picturesque, the vineyards just as endless, and the castles just as grand. Schloss Zell was listed in my first castle and palace hotel book, but severe flooding from the Mosel River closed the hotel for some time. I’m happy to see it has reopened; the surrounding region is one of my favorite areas in Germany. Zell lies right along the Mosel River about halfway between Koblenz and Trier. The nearest railway station is at Bullay, about 5 km away, with a regional connecting bus. 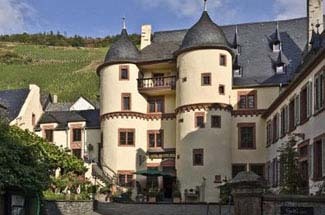 Nestled on one of the narrow loops of the Mosel River, the little village of Zell has become famous all over the world for its Zeller Schwarze Katz (Black Cat) wines. It’s an enchanting town with old gabled houses and a lovely castle that is now a hotel. Unlike most river castles, which perch high in the hills, this one sits right in the middle of town. Many of the guestrooms boast of vaulted ceilings, and all are finely furnished with heirlooms and antiques. The tower rooms are the most desirable. Candlelight dinners are served in a stone vaulted hall, and naturally, Schwarze Katz wine is poured. Sleep in the same room occupied by Emperor Maximilian in 1521.